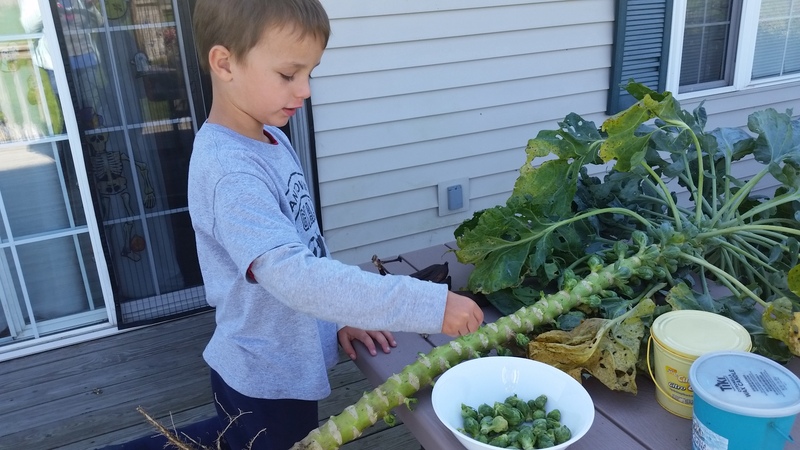 We’ve been waiting for the brussels sprouts to get bigger, but it seems that they’ve grown as much as they are going to. 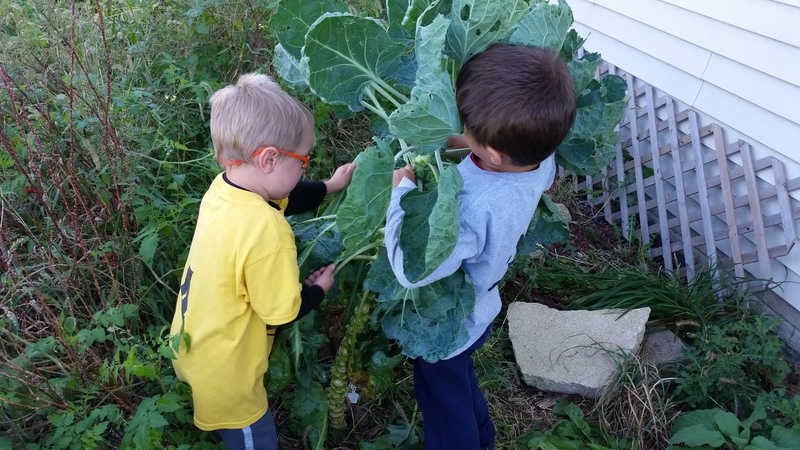 The boys were excited to harvest them and, truth be told, so was I.
I have purchased fresh brussels sprouts, still on the stalk, at the store. 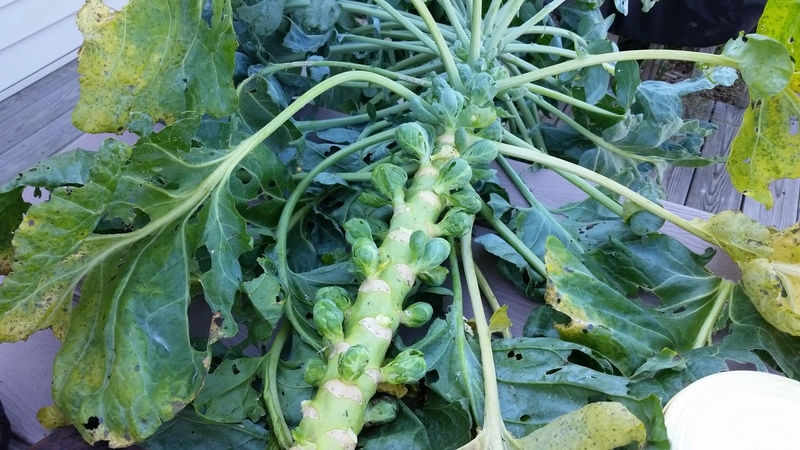 Our stalks are larger and taller but our sprouts are smaller than storebought. I worried that they were not ripe, but the leaves were starting to spread so we tasted one…or two…or three. They were delicious and sweet, with a slight bite. Joe absolutely loved them. He could not stop eating the ‘baby cabbages’. 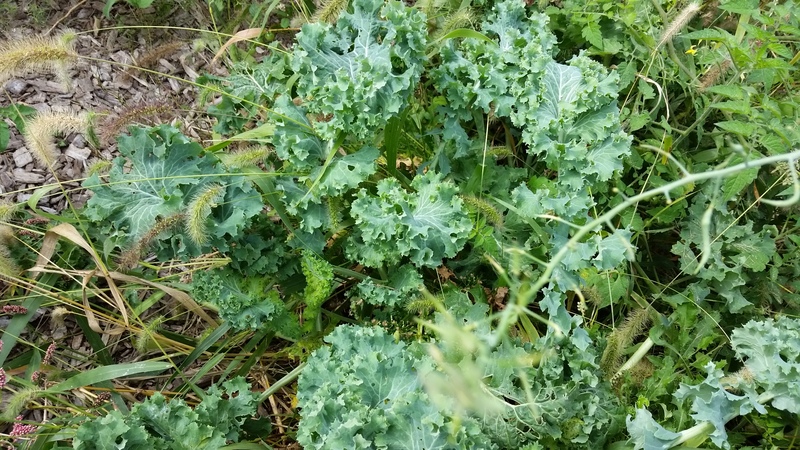 While harvesting these tiny wonders, we found some kale ready to pick. I’d forgotten that I’d planted it so it was a nice surprise and, since it is soup season, will be a tasty addition to vegetable chicken soup. 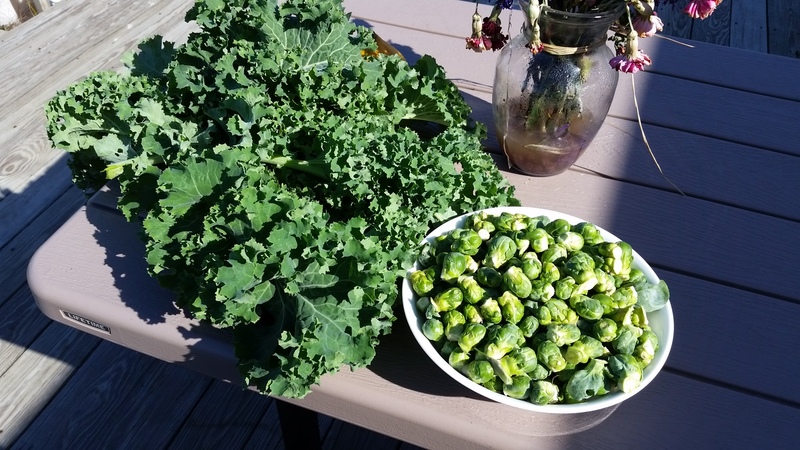 There were also cherry tomatoes red and sweet on the vine and a random cucumber, but the kale and brussels sprouts were the most exciting fall harvest. 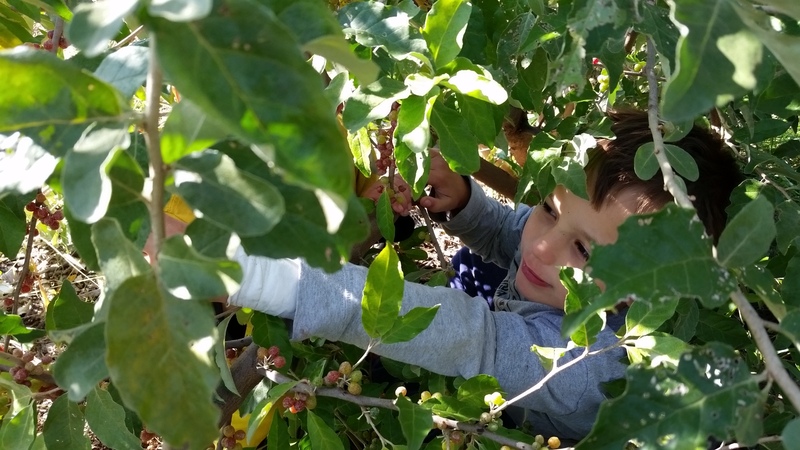 Pumped up by our discoveries, we prowled the homestead in search of more produce ready to pick. We were rewarded. 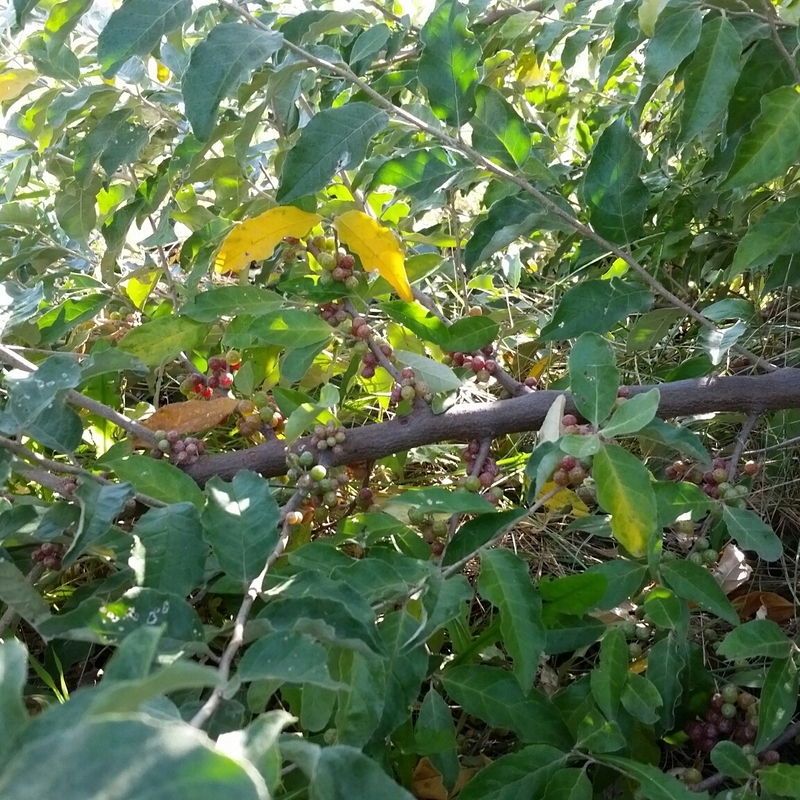 Our autumn olive had red and pink berries that were sweeter and slightly bigger than last year’s crop. They were only on one side of the shrub though. The other side is all new growth thanks to the ice storm that split the plant in two last year. I’m just happy that it grew back instead of dying. 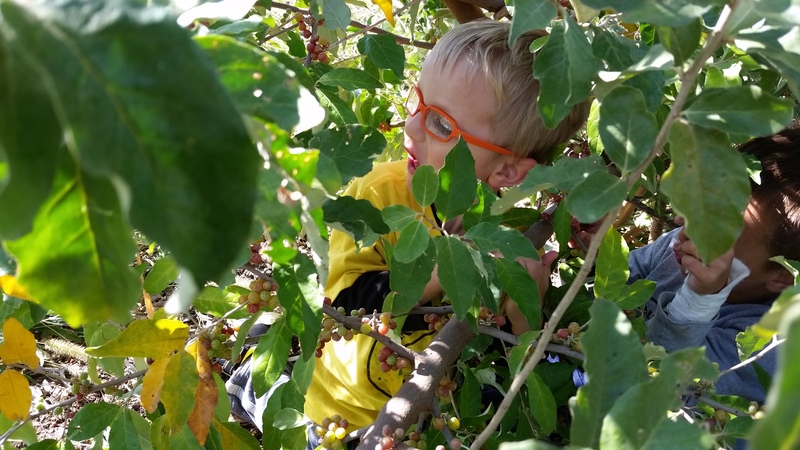 The boys burrowed in and refused to leave until they picked and ate all of the ‘delicious berries’. 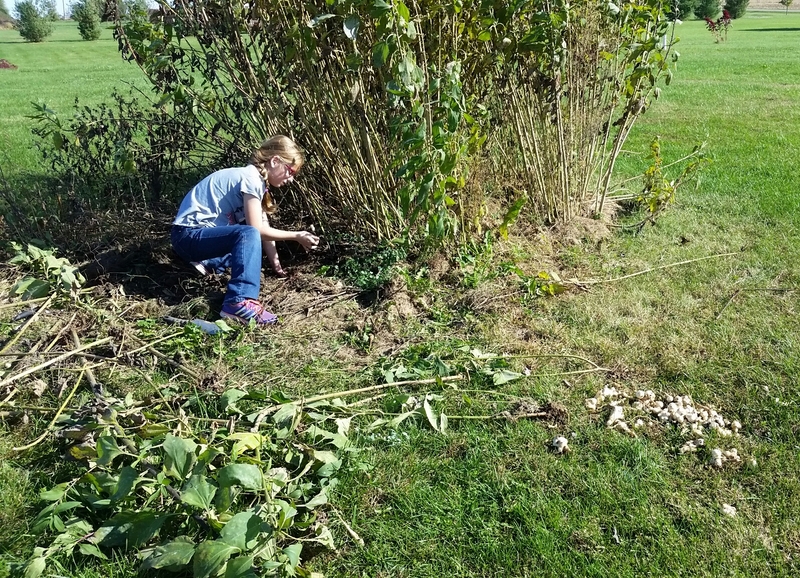 Next, we harvested ‘a few’ Jerusalem artichokes. 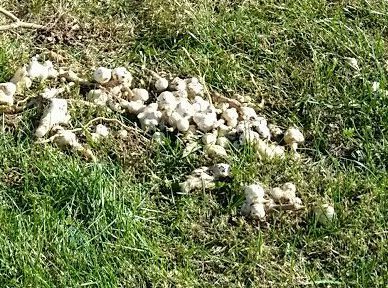 My niece and I spent an hour or so digging them up, but we barely made a dent. There are so many still in the ground and I don’t know what I am going to do with all of them. I froze around half of what we collected, but freezing them changes the consistency. They’ll be mushy so I’ll have to mash the frozen ones in with potatoes and puree them into soups. They can be stored in the refrigerator for up to 3 weeks so I’ll be sharing them with friends and family. I’m not too worried about how far they’ve spread. The yellow flowers are beautiful and the tall green stems lovely. Plus, we do have several acres for them to spread and pop up and we may be able to sell some of them next year. In all, we’ve had a successful fall harvest. Now on to planting garlic before the ground freezes.